Women’s soccer head coach Ron Rainey knew what it was like to be a coach long before he became one. The son of a high school and college-level basketball coach, Rainey took his soccer skills to the sideline almost as soon as he graduated from Wilkes University, where he had been a two-time captain and team most valuable player on the men’s soccer team. After gaining experience at a number of different colleges and universities, Rainey made the move last year to Dartmouth. Now in his second season with the Big Green, Rainey has settled into the Upper Valley and does not seem poised to leave any time soon. His athletes seem quite happy with their new coach. Indeed, it seems that his players are most excited about the culture he has helped grow with the team. Tasha Wilkins ’15, who spent most of her career under other coaches, also appreciated Rainey’s ability to come into the team’s “community and family” with an open mind. She felt this culture was somewhat unique to Dartmouth in general and was happy to see it continue under Rainey. The players had a chance to speak with Rainey before he was hired and said they liked the way he answered their questions. The team’s strategy didn’t change much upon Rainey’s arrival, Wilkins said, as the team stayed with a possession game that encourages getting wide and getting crosses to the middle. Yet she did notice that the team’s last two coaches had different motivation styles, and Delaney agreed. “[Rainey is] really personable,” Delaney said, adding that he asks his players about their academic and personal lives as well as checks in with them each day to see how their legs are feeling. He also uses his captains as sounding boards. When the team is feeling down, he’ll mix things up, she said. “He’s just very in tune to what’s going on,” Delaney said. As much as Rainey’s players love him, he is possibly even more excited to be on Dartmouth’s campus coaching them. There are many things Rainey likes about this school, but first on his mind is soccer. 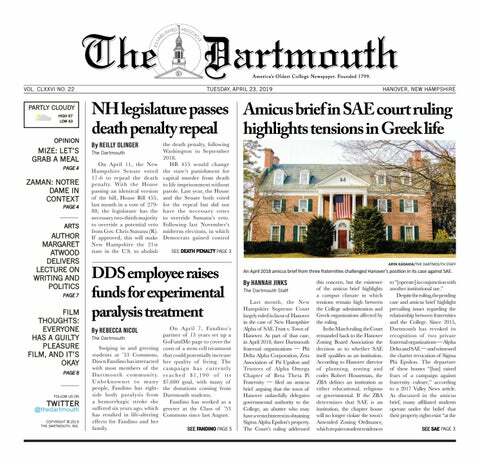 “I feel like Dartmouth really represents some things that are good about athletics and academics,” he said. Rainey’s last job before Hanover was as the head women’s soccer coach at the University of Iowa. To some, a transfer from a Big Ten school to the Ivy League might sound odd, but Rainey said that most things women’s soccer are the same at both schools. Rainey is familiar not just with college-level coaching, but also with non-scholarship athletics through his father, who coached at the University of Delaware when it was a Division I non-scholarship team. “We want to be kind of a community-oriented sport, allow young female players, young boys, young girls, to come out and see us play, and hopefully enjoy the sport,” he said. Rainey likes other things about the College, too, including the fact that athletic administration is made up of coaches he can consult with and that his Dartmouth players have a brother program in the men’s squad to cheer them on and add to their understanding of the game. Iowa fielded only a women’s team. Rainey, though, is not just here for his own benefit. He was hired after the departure of Romagnolo for Notre Dame University. Rainey’s previous reputation was based partly on his ability to turn fledgling and low-ranking teams into title competitors. Before Dartmouth, he brought the Hawkeyes, who had won nine games over the three seasons prior to his arrival, to the Big Ten finals in his eighth and final season and left with one of the best records of any coach at the school. Before that, he headed up a new Ball State University program and in his seven years took the team to a 70-52-17 record. The Cardinals hit 15-3-2 during his final season. Before that, he assistant coached the University of Iowa women in their first two seasons. In fact, before that, it was at Towson University that Rainey first showed his abilities to bring cellar-dweller teams to the top. In one season as head coach, he took the Tigers from a three-win team to America East champions. Dartmouth, however, did not need a rebuild. The team was already competitive when Rainey arrived. Yet impressively, despite the head coaching turnover, the women still found themselves in second place in the Ivies last year, with an 8-5-4 (3-1-3 Ivy) record. This season the team is at 5-1-1, a record built partly on two 6-0 wins. If Rainey can keep the Big Green defense solid as ever, while also pushing the attack to improve, players and coaches alike believe in the possibility of an Ivy League championship. “I learned a long time ago not to worry about why somebody chooses you, but if they choose you, and the fit is there, that you just run with it and work as hard as you can for them,” he said. He also gave credit to his predecessors for having recruited such a strong team. Rainey first made the transition to coach soccer when he headed to Trenton State College — now The College of New Jersey — in 1992 for a master’s degree in education and a position as a graduate assistant coach for the men’s soccer team. But soon, he began to transition to the women’s soccer world. Things got rolling in the women’s world after that, with roles at the University of Wisconsin at Parkside, University of Cincinnati, Towson University and in the Olympic Development Program. Rainey’s circuitous route eventually led him to his new home in the Upper Valley.